The recent release of the March 2017 Iowa Land Trends and Values Survey estimated that Iowa farmland values were slightly higher than they were 6 months ago and only 2.7% lower than a year ago. These results provide some encouragement that perhaps land values are starting to stabilize after falling from their peak. This week we decided that it would be a good time to look at farmland value estimates from around the country. What’s Going on Around the Country? Many different organizations produce estimates of farmland values. Each of these relies on its own methodology to produce the estimate. We discussed some of the pros and cons of the different approaches to estimating land values in this 2015 post, so we won’t dwell on the methods or pros and cons here. Rather, we will just note that each approach has its pros and cons. We believe that to get a good handle on the market one should probably keep an eye on all the different measures. We highlight some of the different farmland value estimates in Table 1. Here, each survey is shown in a row in the table. Along with each survey we have indicated the area covered by the survey, the most recent date that it was conducted, the percentage change in farmland values, and when possible the percentage change from the peak value recorded by the survey. Table 1 is organized with the most recent surveys listed first and older estimates toward the bottom of the table. Starting with the third column of the table we can see that many, but not all, of the recent surveys indicate that farmland values continue to decline. By far, the largest declines were seen in Kansas, where Kansas State used market transactions to estimate that dry cropland values had fallen by 17% in the last year. However, Kansas farmland values were not the only ones showing substantial declines. 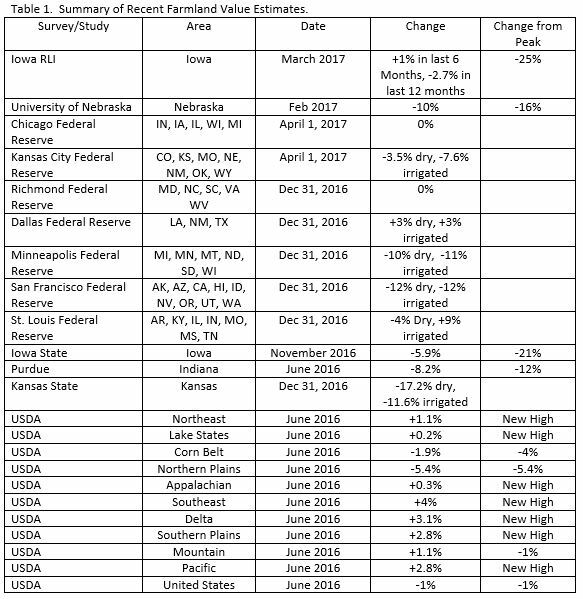 Other surveys that showed rather large declines included, the San Francisco Fed (-12%), the Minneapolis Fed (-10%), Nebraska (-10%), Purdue’s estimate of Indiana farmland values (-8.2%), the Kansas City Fed (-7.6%), Iowa State (-5.9%), and USDA’s estimates in the Northern Plains (-5.4%). On the other hand, the most recent survey in the table, the Iowa Realtor’s Land Institute indicated that Iowa values had increased in the last 6 months. Additionally, many of the USDA estimates indicate that farmland values are increasing. By the USDA’s estimate, the average value of cropland in the U.S. is roughly 1% lower than it was a year earlier. Off the Peak or Still Climbing? The final column of table 1 shows how farmland values compare to their highs. These values were only calculated for surveys that include a numerical estimate of land values (some report quarterly or yearly percentage changes). There are 15 different surveys in which we could calculate a change from the peak. Here, we can see that roughly half of the surveys indicate that land values are well off their all-time highs. For instance, the Iowa surveys show values down anywhere from 21% to 25%. Other notable declines are seen in Nebraska (-16%) and Indiana (-12%). Several of the USDA regional estimates indicate that farmland values are still climbing. USDA estimates indicate that that farmland values are still rising 7 of their 10 regions. The only regions showing declines were the Corn Belt, Northern Plains, and Mountain. Overall, it appears safe to conclude that values have fallen from their peak in the Great Plains states and much of the Corn Belt. This is not surprising given the large declines in the profitability of the types of crops grown in these states. It is also worth remembering that these are generally the areas that saw the largest increases in farmland values from 2004 to 2014. This can be seen in Figure 1 which David discussed in an earlier post (read more here) and shows large variations in farmland value changes across the U.S. Figure 1. 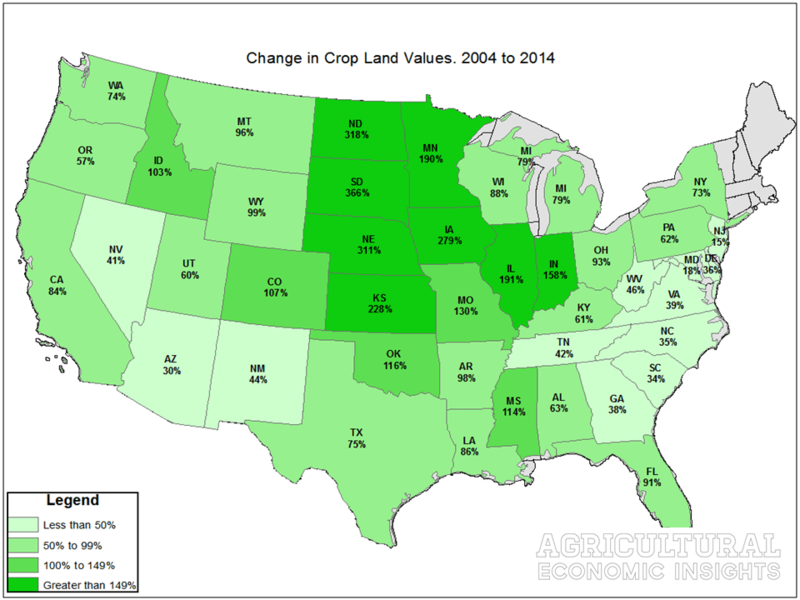 Percentage Change in Farmland Values from 2004 to 2014. The tremendous increase in U.S. farmland values is well documented. After a long period of slow, but steady, improvement from the late 1980’s farmland values began to shoot rapidly higher in the mid-2000’s. Since that time, many people have been wondering if they would decline as rapidly as they increased. Although there has been some decline, to date, dramatic declines such as occurred in the 1980’s have not occurred across the country. Today, it appears that farmland values in the Great Plains and Corn Belt are rationally reacting to lower farm incomes. For the most part, the declines appear to have been somewhat measured. However, there are some estimates of substantial declines. For instance, the estimates of declines in Kansas are very large. Declines of this magnitude are a significant red flag. As we go forward it will be important to watch closely to see if land values stabilize at these levels or continue to work their way lower. In large part, this will likely be dependent upon how the longer-term outlook for commodity prices evolves. Further deterioration would likely result in additional declines, whereas stabilization or improvement would likely provide support for farmland values.